So the Gallery means that you have bigger seats, the type of seats depend on the Gallery that you go to. We usually go to Liverpool One and here there are couches so you can spread out and relax properly. You’re sat at the very top back of the cinema screen and the only people to have access should be the staff and the people sitting in the Gallery. You cannot bring children under the age of 18 into the Gallery due to the fact that there is a bar and alcoholic drinks can be purchased. Included in the cinema tickets are the big couch seats, unlimited popcorn, unlimited nachos and sauce, unlimited soft drinks and in Liverpool One there’s always a REALLY BIG box of Quality Street to help yourself. There is a bar where you can order drinks from in the foyer where you can relax before your film starts. We usually arrive around 45 minutes before the film so that we can have a drink and some nachos before getting some popcorn and another drink for the film. It is a nice and relaxing environment and if you’re not sure about which screen or where your seats are then just ask a member of staff and they will show you to your seats. Like I say, it isn’t the cheapest option, the price varies depending on the film but ranges from £18-£23 per ticket. This doesn’t include watching a 3D film or a film in the IMAX screen (they are subject to higher charges). It is definitely well worth the price, but make sure you take full advantage and arrive earlier than your film is due to start! Remember under 18’s are NOT allowed in the Gallery. Check on the Odeon website for your nearest Gallery. Previous Previous post: Alton Towers – New Wicker Man Ride. That sounds so cool, ive never heard of this! If i was going to watch a movie i was super excited for id defo see if my local odeon had this!! 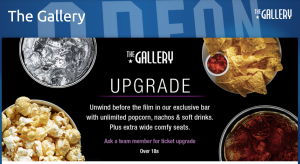 Wow this sounds fantastic, i dont really go to the cinema much so didnt know they had this option available. I would definitly use this service though probably because i dont go so much, it would make it a better experience and worth the prices too. Thanks for sharing.